Standard cylinder kit for vertical air-cooled Minarelli engines. Great price! The cylinder kit is identical in size and performance to the original, making it an obvious choice for a road legal replacement. 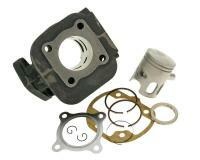 Top choice if you are looking for a replacement cylinder kit. Kit dispatched complete with all individual parts, but without cylinder head. Cylinder head can be ordered separately.